* Anemometer : 0.4 to 30.0 m/s. 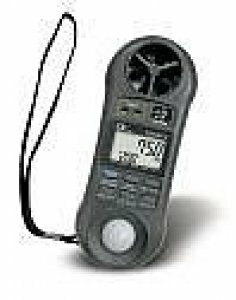 * Anemometer unit : m/s, km/h, MPH, knots, ft/min, oC/oF. * Light : 0 to 20,000 Lux, 0 to 1,680 Ft-cd, auto range. * Same as LM-8000 but with air flow (CMM, CFM).